. The clarinet is one of those instruments that the term irrepressible describes ideally, and Mr Barner is most definitely an irrepressible performer. It sounds at times as if the instrument is dancing and laughing as he plays it, and you can't really call Ten Tunes a sad or emotionally down album in any way or form. Ten Tunes is a great listen and great fun - the musicianship is high quality and this is an album that will make you feel good for the rest of the day. Highly recommended; as well as this from Something Else Reviews, But what I enjoy most about Ten Tunes is Barner’s willingness to take his clarinet to music other clarinet players might not dare go. Songs like “Flying Monkeys,” “Charm Offensive,” “and “Squeaky Rico” are such a seamless assimilation of styles, it’s often hard to spot the influences. 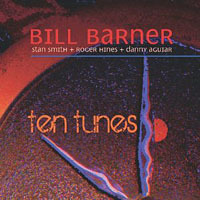 The music, all composed by Barner, is fresh and contemporary, a testament to Barner being so in tune with so many styles of music that he doesn’t need to take any shortcuts. Bill has played jazz in Washington, D.C. for 25 years. And he’s played in bands that have shared the stage with Michael Franks, Mike Stern and Mark Isham. Bill played on Tobin Mueller’s Rain Bather, winner of Album of the Year for 2009 at Chicagojazz.net. He has created music for two modern dance companies. Bill holds degrees from the University of California and Kent State University and he studied at the Creative Music Studio in Woodstock, New York. He played orchestral and chamber music in California. Bill plays clarinet and tenor sax in jazz combos and big bands. Backun cocobolo clarinet. Mantra tenor saxophone. Wanne mouthpieces. All About Jazz musician pages are maintained by musicians, publicists and trusted members like you. Interested? Tell us why you would like to improve the Bill Barner musician page.